Storytelling isn't just for children. Adults are continually surprised by how much they enjoy a live storytelling event. There is a unique quality that storytelling possesses that no other type of live performance holds. If you think about it, storytelling and the love of narrative, the love of basic stories: beginning, middle/conflict, end/resolution is inherit in our culture here in the United States and elsewhere in the world. We all love a good story. That is why you'll find "story" used for entertainment - a beginning, conflict, and resolution, in books, magazines, radio, films, television, and also in television commercials: e.g. "You have a problem, what to do? Our product solves your problems." The next time you relate a dream you had night before to a friend - ask yourself: Did you put it into a narrative form? Did you give it a beginning, conflict, and resolution? Was your dream really like that? Or did you impose that form into your telling of it? Giving our dreams a story format is natural, that's how we make sense of the nonsensical. Check it out, stories and storytelling are everywhere. Today, unlike ten years before, there are many storytelling radio shows, and live national broadcasts that highlight the personal story. They celebrate the real human experience, add music, and broadcast them nationwide. Such as: This American Life, The Moth Radio Hour, and Snap Judgment. Plus a new Olympia local, live opportunity to hear stories and tell them: StoryOly. Storytelling is where it's at. 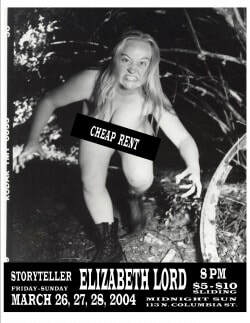 Elizabeth is available to perform and enliven any event, conference, or special occasion. She can customize her performance and selection of tales to fit any unique situation. 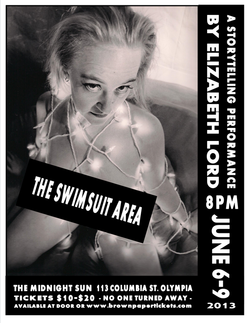 To contact Elizabeth to perform for your next event click here. 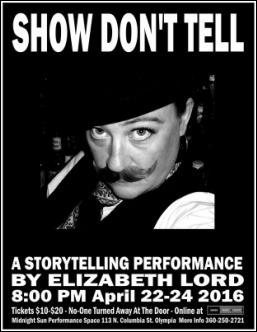 In addition to commissioned performances, Elizabeth writes and produces her own one-woman storytelling shows. 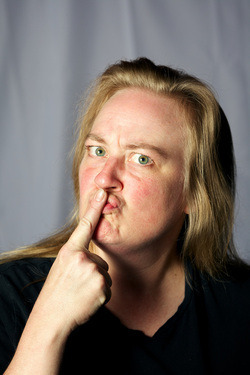 Her storytelling performance style has been compared to Spalding Grey and Margaret Cho. These shows are definitely for grown-ups as that they contain content not suitable for folks under the age of 14. But adults love them. Her last solo show was Homesick, which premiered in June of 2018. She is available to come and recreate these shows at your venue. A tale about being sick of home, ensuring domestic violence, and the relief of summer camp. A tale of performing in community theater productions, running the Midnight Sun Performance Space, and Bruce Springstein's Born to Run. A show about the choice to not have children, why that happens, the artist's lifestyle, and the nation's favorite unspeakable: abortion. 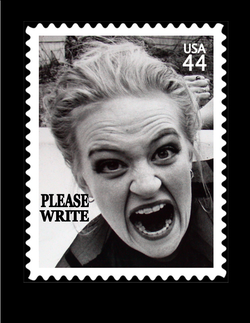 A show about the dying phenomena of long-hand, snail-mail letter writing. Each audience member received a pre-stamped postcard with this image on it. On the back were the words, "I just saw this show and thought I'd drop you a line." 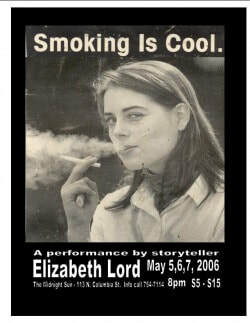 Elizabeth encouraged audience members to write to someone and surprise them with this postcard. ​A show about loneliness and the steps a person takes to find a personal connection. A tale about working in a bar, observing patrons, cleaning up their messes, and raking in the moolah. A show about sharing a house with other adults. Sharing rent, and space, and saving money so one can pursue a career in the arts.